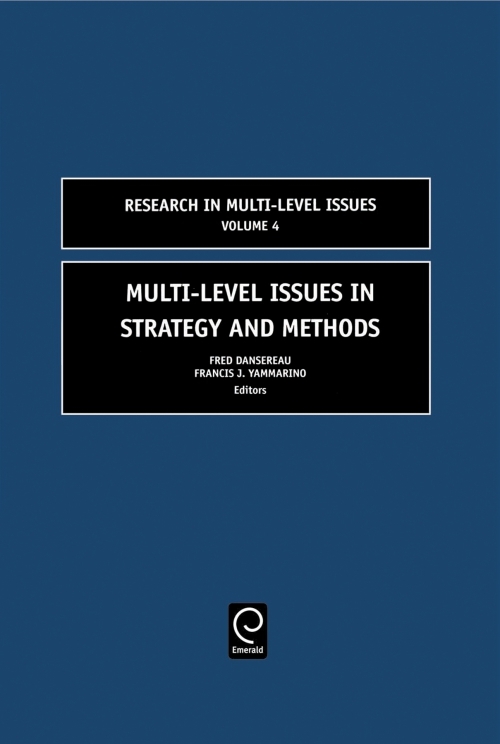 "Multi-Level Issues in Strategy and Methods" is Volume 4 of "Research in Multi-Level Issues", an annual series that provides an outlet for the discussion of multi-level problems and solutions across a variety of fields of study. Using a scientific debate format of a key scholarly essay followed by two commentaries and a rebuttal, we present in this series theoretical work, significant empirical studies, methodological developments, analytical techniques, and philosophical treatments to advance the field of multi-level studies, regardless of disciplinary perspective. Similar to Volumes 1 (Yammarino and Dansereau, 2002), 2 (Dansereau and Yammarino, 2003), and 3 (Yammarino and Dansereau), this volume, Volume 4, contains five major essays with commentaries and rebuttals that cover a range of topics, but in the realms of strategy and research methods.In particular, the five "critical essays" offer extensive literature reviews, new model developments, methodological advancements, and some empirical data for the study of innovation, strategic performance, upper echelons, latent growth modeling, and intra-class correlations. While each of the major essays, and associated commentaries and rebuttals, is unique in orientation, they show a common bond in raising and addressing multi-level issues or discussing problems and solutions that involve multiple levels of analysis. About the Editors. List of Contributors. 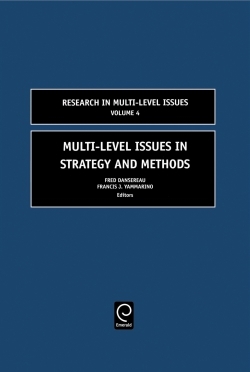 Overview: Multi-Level Issues in Strategy and Methods. Part I: Innovation. Innovation in Organizations: A Multi-Level Perspective on Creativity. Resolving Some Paradoxes of Innovation: A Cross-Level Interpretation. "We Want Creativity! No, We Don't!" The Creatvity Paradox: Sources, Resolutions, and Directions. Part II: Strategic Performance. Multi-Level Issues for Strategic Management Research: Implications for Creating Value and Competitive Advantage. Developing Multi-Level Theory in Strategic Management: The Case of Managerial Talent and Competitive Advantage. A Resource-Based Lens on Value Creation, Competitive Advantage, and Multi-Level Issues in Strategic Management Research. Multi-Level Issues for Strategic Management Research: Further Reflections. Part III: Upper Echelons. A Multi-Level Analysis of the Upper Echelons Model. Moving (Finally) Toward a Multi-Level Model of Upper Echelons. Upper Echelons Perspective and Multi-Level Analysis: A Case of the Cart Before the Horse? A Multi-Level Analysis of the Upper Echelons Model: Planting Seeds for Future Research. Part IV: Latent Growth Modeling. Multivariate Latent Growth Models: Reading the Covariance Matrix for Multi-Level Interpretations. Multivariate Latent Growth Modeling: Issues on Preliminary Data Analyses. A Note on the Computer Generation of Mean and Covariance Expectations in Latent Growth Curve Analysis. The Value of Heuristics: Clarifying the Purpose of TSA to Analyze Multivariate Latent Growth Models. Part V: Intra-Class Correlation. Significance Tests for Differences Between Dependent Intra-Class Correlation Coefficients (ICC's). Interpreting Changes In ICC's: To Agree or Not To Agree, That is the Question. A Model Selection Approach to Testing Dependent ICC's. More on the Comparison of Intra-Class Correlation Coefficients (ICC's) as Measures of Homogeneity. Part VI: About the Authors. About the Authors.